The TRANSLAMATIC C.) 1252 - 350 is a robotic welder guided by the multi-programs computerized commands «Charlie» : Premier and Executive, separated in a box. The automatic moves X and Y can be used combined or separately for the execution of the several types of shapes for rebuilds. The Executive version is delivered including : PGA, Roll N' Roll 0515, Charlie command in a separated box, Automatic clamps set for rails, Alimentation cables, Small tools suitcase. 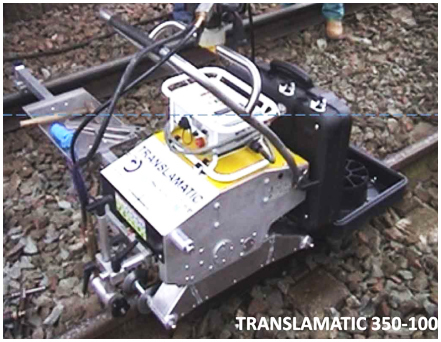 The TRANSLAMATIC ® 350 is a robotic welder guided by the multi programs computerized commands «Charlie» : Premier and Executive, which can be integrated to the frame or separated in a box. 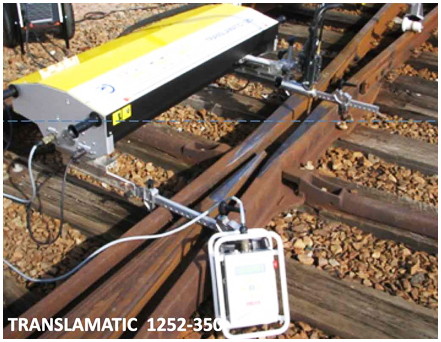 The Translamatic 350-100 is specially designed high performance equipment for Reconditioning of Rail Wheel Burns, Scabbings, Weld cuppings, Battered ends etc. It uses a customised welding consumable TRANSLARAIL, size 1.6 mm. Its small dimensions and weight allow to put the TRANSLAMATIC 0 350 on work very easily : Put on work and job execution done by one operator due to its modularity and its multi positions handles, alignment, support and moving on the rail are guided by 2 tandem wheels, Compatibility with the universal torch support with the PGA and the Roll N' Roll 0515. The Executive version is delivered including PGA, Roll N' Roll 0515, Charlie command in a separated box, 10°kit for chamfered rails, Alimentation cables, Small tools suitcase.